If you visit the park and follow the blog, you're likely aware of the many projects our Capital Department has already completed this year to improve aspects of the park like the lawn and the Southwest Porch. Well, another ambitious project is now underway in the park. What: The creation of an underground electrical facility to provide power for all the park's activities and events. 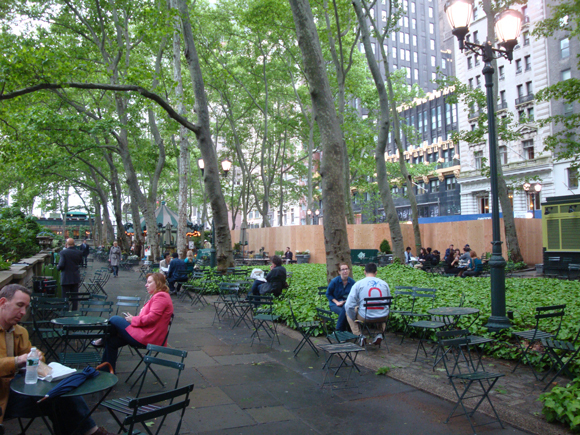 Yes, even – and especially – the big ones like The Pond and Holiday Shops at Bryant Park, that have always required noisy and unsightly portable generators stationed next to the park for the duration of their season. Work on the project will take place this summer in the park so we can go generator-free for the 2011-2012 season of the Pond and Shops. Once the facility is constructed, the project site will be restored to its original condition and you won't even know you're lunching on top of the park's new and sophisticated electrical hub. Where: Mid-block on the 40th Street side of the park. 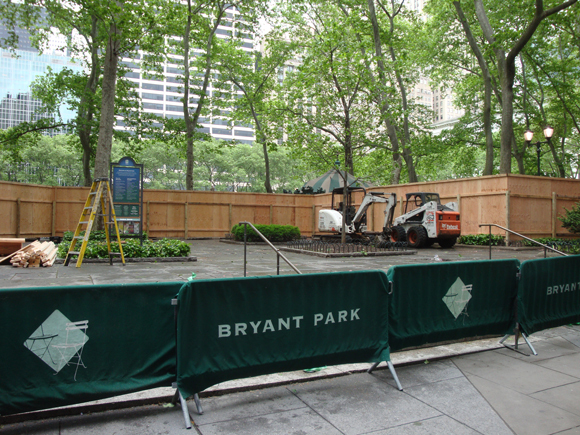 The Bryant Park Capital crew has started installing a construction fence that changes public access on the south side of the park. Work on the project will take place inside the fenced off area, with materials and equipment loaded in periodically from 40th Street. As the project develops, access to the sidewalk and parking lane on the north side of 40th Street will change. We'll keep you updated. Le Carrousel will still be open for regular business during the construction period. Our Design Department is planning to turn the boring, brown fence into a Bryant Park work of art...we look forward to seeing what they come up with!